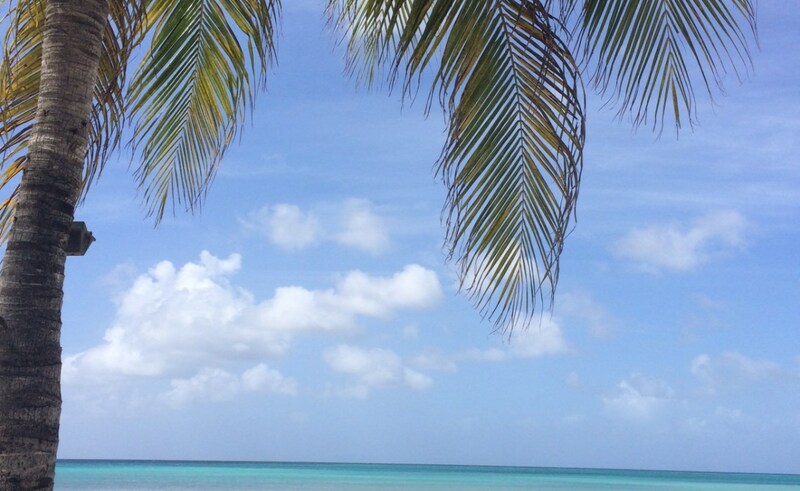 After three years in Barbados is was time to move on. Or rather my husband’s work visa expired and he didn’t wish to renew it. We were in the fortunate position of debating where in the world would we live since he had a few employment offers from a variety of countries. Yes, I hate us too! After many discussions and research, we had settled on the Bahamas as our next home and were all set to move there. All visas had been processed, our animals booked to fly and we started to think about packing and started property hunting. There is never a dull moment with us though and just before he signed the dotted line to move, another opportunity arose which was closer to my husband’s heart during his time travelling in the region. A bottle of rum was poured and relocation discussions were held in our garden. Our move was then changed to Aruba. The same dates, just a different country! Once you make that initial move abroad each subsequent move is a bit easier as you know what to expect and what not to take. I like to live a decluttered life so local charities always do well out of our moves. Costly for us, as you have to keep starting over again with the basics but you need to weigh up the shipping costs of heavy crockery when you can purchase it again. Is that an excuse for shopping? Perhaps, but it’s my story and I’m sticking to it! Although this time I did the animal export/import myself. That was something I was nervous about as I had it in my mind that it would be complicated and involve a lot of bureaucracy. Not so, and it was fairly straightforward. The move to Aruba was made so much easier by the help we received from his new employers. They were amazing and went above and beyond helping us find somewhere to live, setting up our home and where to shop. All the essentials that can be daunting when you first move abroad. Honestly, they were so great that they should consider a side business of expat relocation services! If you think finding somewhere to live and dealing with realtors/estate agents is difficult in your own country, try doing this with another country when you are living elsewhere! Then add animals into the equation and things get a bit challenging! Especially when you are told that some properties will only rent to you if you keep your animals outside. In a hot country. The phone had to be taken off me a couple of times before the death threats started. Just as we were coming to terms that we would all be living in a tent on the beach, a great house appeared! Moving abroad is just a rollercoaster of emotions and frustrations at times! So, finally we all landed in Aruba. I had never visited the island so a lot was initially very new to me. The landscape is very different to Barbados. The house styles are very different with most houses being low rise buildings. You can see a Spanish influence in the design. The terrain is flatter with a few hilly peaks. 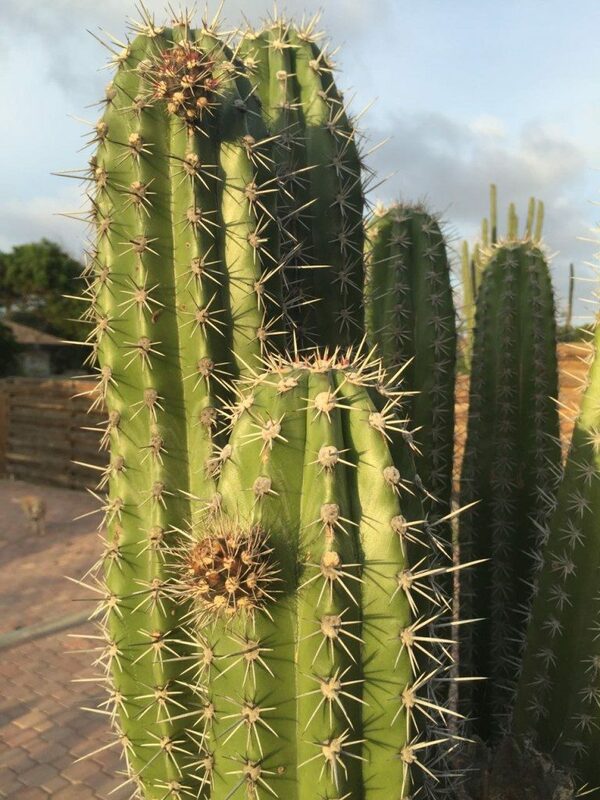 Cactus is everywhere. I felt like I was on the film set to Breaking Bad. You could film a Western in our garden. However, the beaches are just as beautiful and have soft white sand and about 50 shades of blue. Okay, about 5, but still stunning as you would expect in the Caribbean. 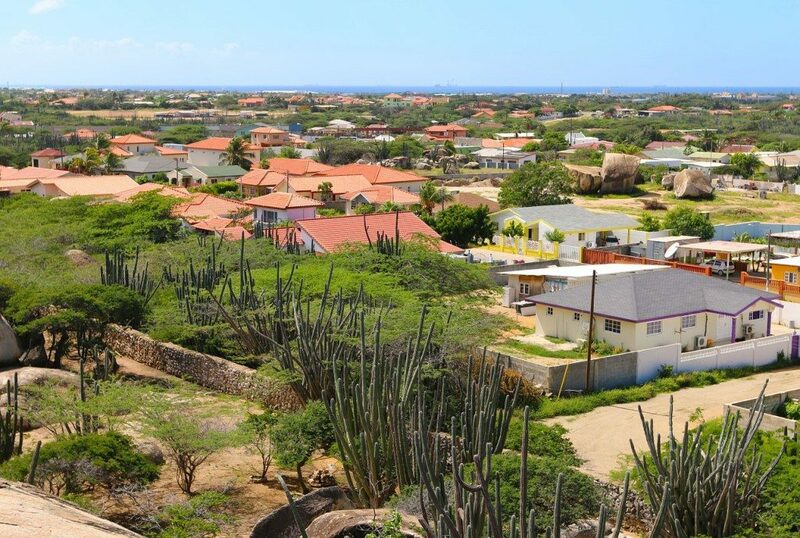 What hits you immediately is the genuine warmth and friendliness of locals in Aruba. I’m in awe on how they can switch from many languages with Papiamento being the local language, with Dutch, Spanish and English spoken with similar frequency. I now have the dilemma of what language to learn first! As we visited one utility company after another, the whole process was so smooth and once again I was struck by how friendly and helpful staff were. Not a single “You don’t have the right information” after sitting in uncomfortable chairs for hours. We received a genuine welcome to the island. What parallel universe am I in? The roads in Aruba are well marked, in good condition and I love how the lanes in roundabouts are marked with a raised area to ensure that drivers take the correct lane to ensure a good flow of traffic. I almost sobbed with joy when other drivers used their indicators too! I have rarely seen that over the last 3 years and not having someone cut me up at a roundabout as they are in the wrong lane without indicating is a welcome feeling! Iguana’s are everywhere. Upon walking into my garden for the first time, a whole crowd of them scattered for cover. I am fascinated by them as I loved the lizards and geckos in Barbados, but these are much bigger with longer tails. 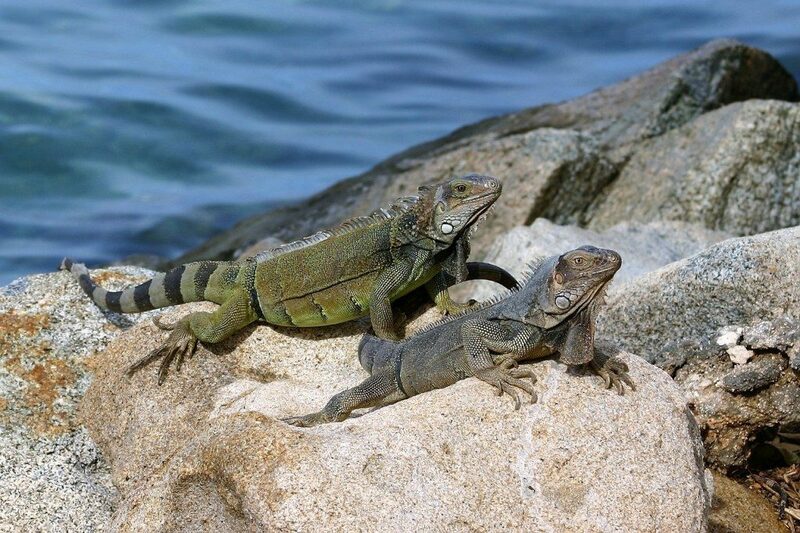 They bask in the sun on the surrounding rocks and also hang onto the cactus. My dogs have an equal fascination and have already chased one into our pool. One of my dogs has now developed goat like abilities and jumps all over and around the large rocks searching for these mini dinosaurs! We have swapped our daily monkey watch for Iguana watch. As a food blogger, my first point of call was the supermarkets. I love visiting supermarkets when on holiday too, just to see the different flavours of common brands, the various sauces and spices akin to the country that I am visiting. As I was greeted into the large, clean, well-lit supermarket I had to suppress another sob of joy. It’s very similar to supermarkets back in the UK with the layout and design. Furthermore, so many choices of food. All my special needs are catered for, a massive selection of vegetables and a variety of dog and cat food for my furry babies. Oh, and the cheese! The wonderful selection of cheese. 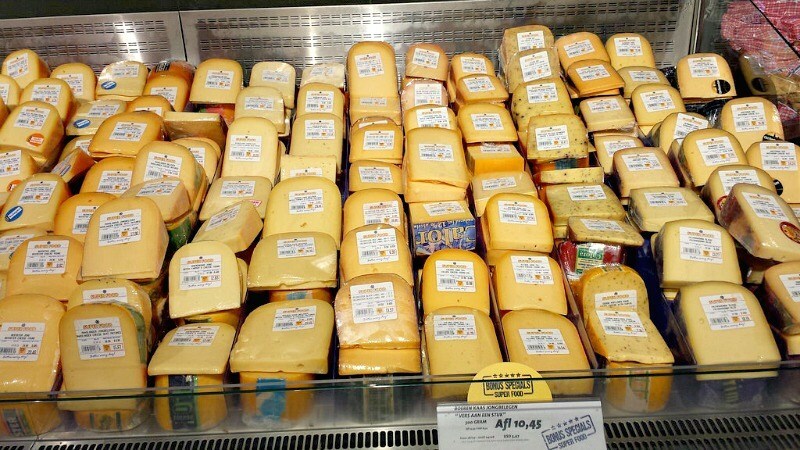 Gouda is a Dutch cheese and I’ve never seen so many varieties. Everywhere I turned was a Gouda delight! As we are settling in comfortably I am starting to have a panic that there is nothing strange about living on this island and my blog will be empty! I shall endeavour to investigate further once the house is unpacked and the mini zoo are settled!